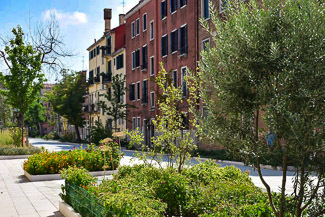 The Rio Terà dei Pensieri is just a short walk from airport buses, taxis, and the People Mover to Venice's Marittima cruise terminals, but it feels like another world entirely: The street is lined with trees, flower planters, a couple of cafés, and a handful of visitor accommodations--among them, Il Veliero Romantico, a tiny guesthouse with three attractively-furnished twin rooms and (for hostelers) a three-bed dormitory. As a bonus, the twin rooms have electric kettles for making tea or coffee--a feature that English-speaking travelers love, but that can be hard to find in Venice. Cross the bridge and walk straight ahead, past the Hotel Arlecchino (another hotel that we recommend) and the restaurants along the canal. Turn right into the next street, the Rio Terà dei Pensieri. Walk past the Alloggi Marinella to a yellow building with a grillwork door. Ring Il Veliero Romantico's doorbell for admittance.